Boccone dolce means “sweet mouthful.” It is a classic Italian dessert. It’s a cake without any cake. 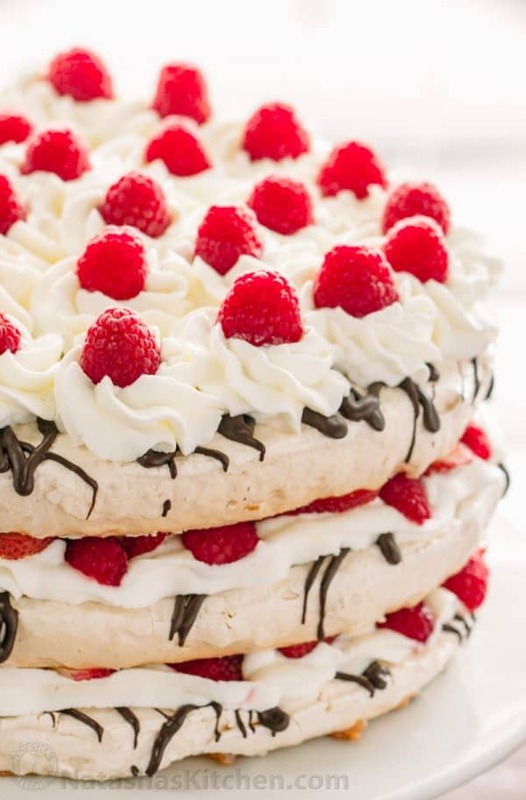 This Boccone Dolce Cake has three crunchy meringue layers, chocolate, cream, berries and more berries. 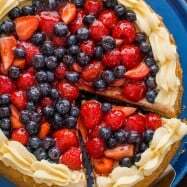 Each slice is drizzled with a berry syrup. Oh my gosh! 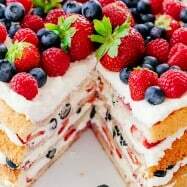 Its the best of everything in one cake. 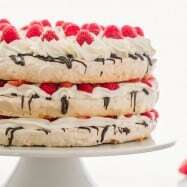 My friend Mila Ivanov sent me this wonderful recipe and I’m so glad she did! I made this for my sisters baby shower and it was a hit! There was a run on the cake and no slice was left behind. Mila, thank you so much! Preheat the Oven to 200 °F. 1. Draw three 9 1/2 inch circles with pen on parchment paper then flip paper over so you aren’t placing meringue over ink. Use pen so you can still see the circle through the paper. 2. Beat Room Temp Egg whites with sugar, 1/4 tsp salt and 1/4 tsp cream of tartar for about 7 minutes on high speed in your stand mixer with the whisk attachment, or until stiff peaks form. Note: if they aren’t room temp, they will take much longer to beat. 3. 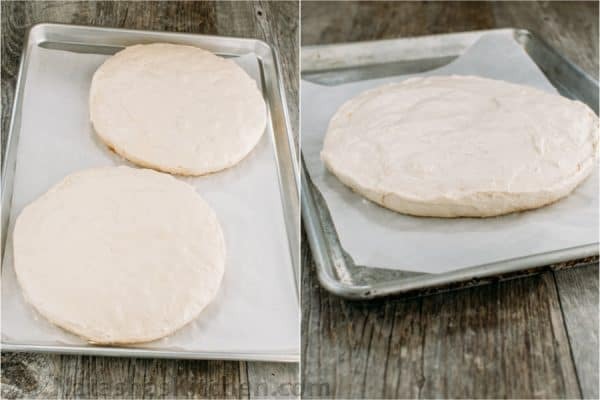 Divide the egg white mix between the three circles on parchment paper. Form the three layers into about 1″ tall circles and shape them as evenly as possible. Flatten the top so the layers sit on top of each other easily when you assemble the cake. 4. Bake for 6 hours at 200˚F, rotating the pans every 2 hours for more even cooking (mine were on two racks in the upper and lower thirds of the oven). If any of your layers are still springy in the center after baking, turn off the oven and leave them in there another hour to fully dry out. Remove from oven, pull layers off the baking pans and cool to room temp. 1. Freeze the mixing bowl and whisk attachment for 15 minutes. 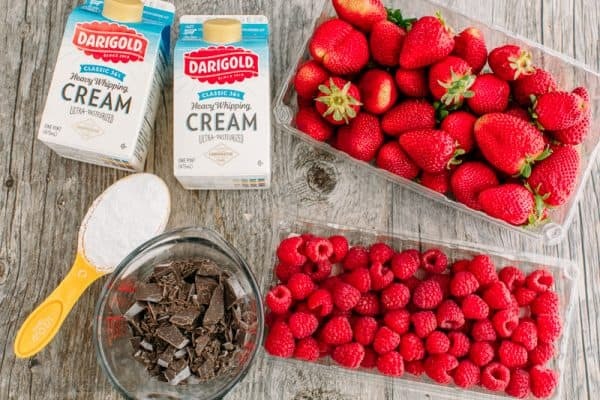 The cream will form best if your bowl and whisk are super cold. Also, keep your heavy cream in the fridge until you are ready to use. 2. Beat 3 cups heavy whipping cream with 1/2 cup powdered sugar for about 2 minutes or until stiff peaks form. Refrigerate frosting until ready to use. Assemble the cake shorty before serving. It is best eaten within 2 hours of assembling. 1. Rinse and dry berries and slice strawberries the long way. 2. Melt chocolate according to package instructions. As soon as the chocolate is melted, spread it over the tops of each of three layers (see tip for success #2 below). 3. 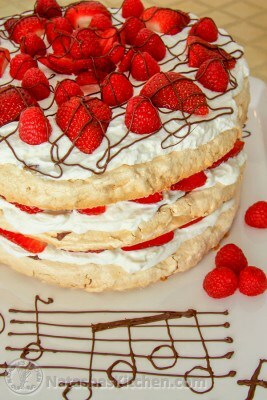 Place the first meringue layer on the platter you will be serving the cake on. Spread or pipe a little less than 1/3 of the frosting over the first layer. 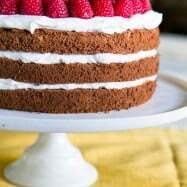 Place a layer of sliced strawberries over the frosting. 4. 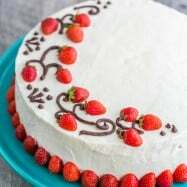 Repeat with the next two layers and decorate the top by piping remaining whipped cream and topping with berries and more chocolate if desired. The slices get a little messy and that’s ok! 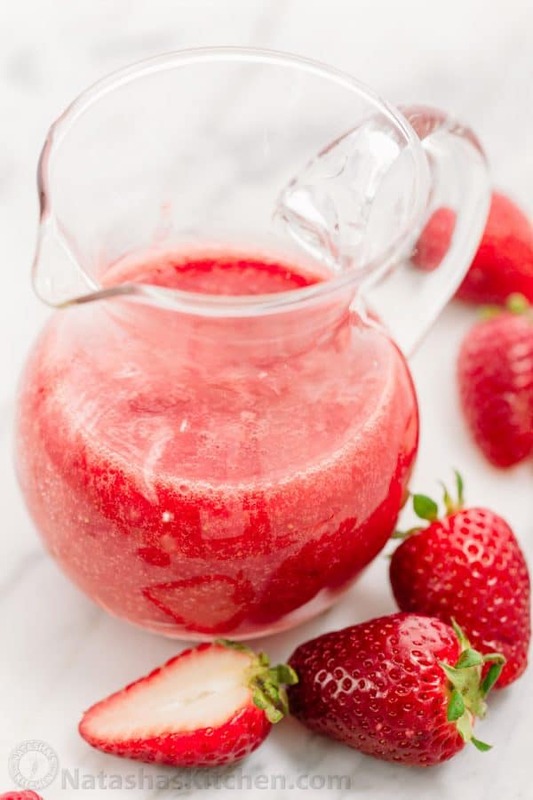 🙂 Use a food processor or blender to pulse your thawed strawberries with 1 to 2 Tbsp sugar and drizzle over the top of each slice. I’ve been bombarded with requests for this cake. Hope you enjoy it thoroughly!! Does anyone know what I can do with all of those egg yolks hanging out in the fridge? What temperature do you recommend for a gas oven? 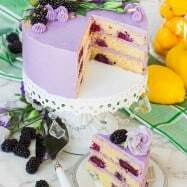 This cake is delicious!!! I’m making it for the second time because it was such a hit with my family last time I made it. Make flan. All the yolks with 1.5 cup reg milk, one can condensed milk, 1tsp vanilla, lemon zest. Made the cake and it came out wonderful! Thank u! Make the caramel sauce using brown sugar and pour in the pan (I usually use a medium sized loaf pan). My recipe usually calls for 3 pans. Swirl the caramel sauce to cover the sides of the pan – leave about half an inch. Set aside. Beat 8 eggs for about 2 minutes, add 3 cans of condensed milk (400 grams ea) and 3 cups of fresh milk. Beat for 5 more minutes at low speed. 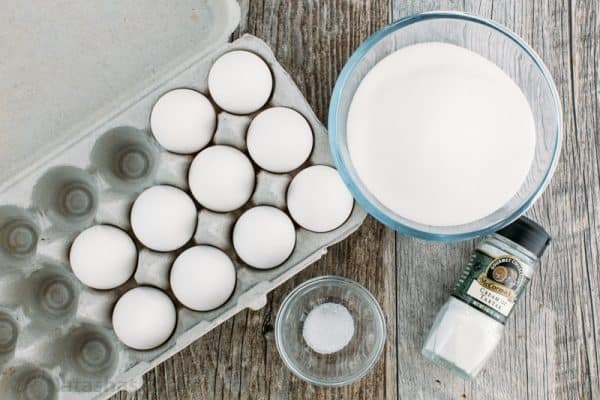 Since you will be using just yolk, you can pour the mixture directly in the prepared pans, if you are using also white, you have to strain the egg mixture first. This will ensure that your flan will come out soft and not chewy. Pour the mixture in the prepared pans. The caramel sauce should have hardened by now. You can either steam it for an hour (cover the pan with a cheesecloth to absorb the steam water) or bake in the oven at 375F for 45minutes – 1 hour (put a pan of water at the bottom shelf so as not to dry out the flan too much). This actually depends on the oven, so try to check it after 45 minutes by inserting a toothpick in the center. When it comes out clean, turn off the oven. When I am doing other things, and the toothpick still hasn’t come out clean but almost, I turn off the oven and just keep the flan in the oven for another hour. It will still get cooked but it will not burn even if you forget to take it out after an hour. To serve, let it cool down, run a butter knife around the edge of the pan, put a plate on top and turn the pan over. I prefer serving it after a few hours in the fridge. Could you please leave the old recipe on here? The new one doesn’t turn out as good. Thank you! 🙂 we love your site and always use it. 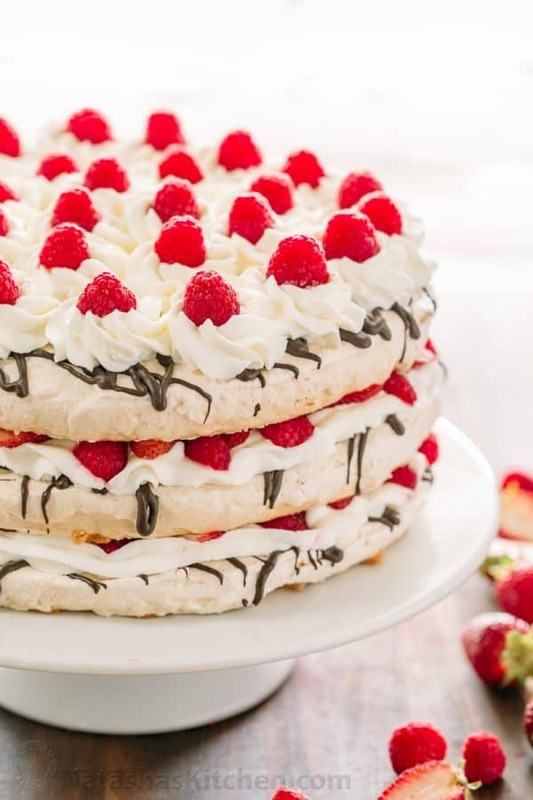 This is such a yummy dessert, we love it! I think it was thick enough…I’ll beat it more in the next batch to be on the safe side. I used parchment paper. Some separate googling I did suggested that my oven may be a bit stronger than usual so I’m trying it at a lower heat. Natasha the cake turned out really great, I froast it on Tuesday night and it was prefect, it wasn’t runny it was just enough moist. It was delicious. The pic of it is on my instagram page alla62. I will post one cut, later today. You should definatly try it like that. I found that it was much easier to do then Kievskiy. I saw the photo on your feed. Thank you so much for sharing the pics! Your cake looked amazing! I love how you made them tiered; just gorgeous! Which frosting did you end up using? Hi, I have questions regarding the meringue. You say here to put the egg whites and sugar in a bowl on high for six mins until stiff peaks. Papa Hyden’s recipe says beat until stiff, then add sugar every one to two minutes 1 TBSP at a time on medium speed. This would take 30 mins or so more. I have also sen many other ways, all fairly similar. I just want the best product, so I am a little confused. Can you help me? Thank you for your time. I tried it the long way, seemed to work ok. Tried drying two at a time and I think my oven is pretty basic (cheap). One came out ok and one wept a lot. Oh well, back to the drawing board. Отделить желтки от белков. а желтки взбить с сахаром, добавить сливочное масло (оно комнатной температуры,мягкое) и сметану, которая уже перекипела и увеличилась в объеме,теперь добавляем орехи(кстати,я их режу покрупнее,а не измельчаю в пыль-так вкуснее)ну и мука.Тесто должно получиться, как густая сметана. This is what you can do with the egg yolks in your fridge: Olive Garden Alfredo Sauce Recipe: Yummy!!!! It’s all good. At least I didn’t try hand-whipping like I originally intended, though I insisted on hand-whipping the cream. It’s like making a baby- hard work, but worth it when you stare lovingly at it’s perfection and think “I made this!”. And eat it.The cream, of course. My hubby LOVES brown-ish bananas, but the odd thing is… he actually gets heartburn. I did too until I stopped snacking before bed 😉 It really did the trick for me! I re-sent it, hope it went through! 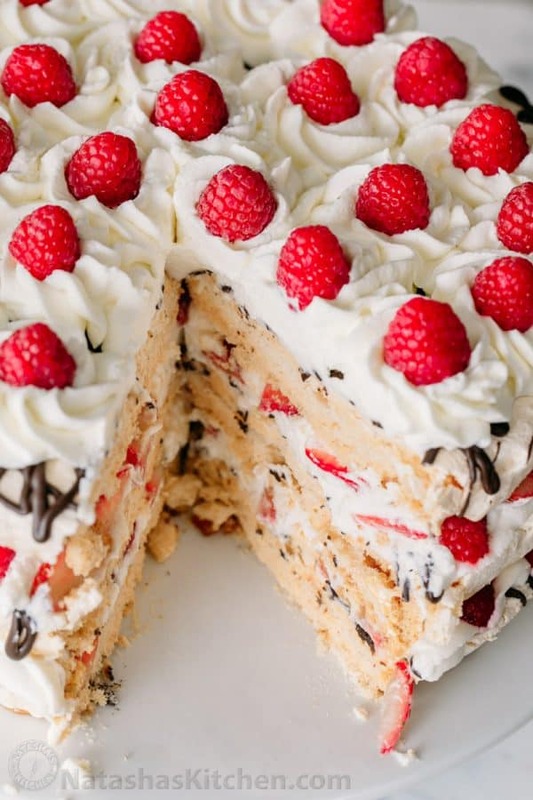 Mouthwatering….. Beautiful, delicious cake. Love the decoration!! !